The Hellcat was the first US Navy fighter for which the design took into account lessons from combat with the Japanese Zero (Editor's note: this may well be urban legend stuff as the Hellcat was almost fully developed before the US was able to get its hands on a Zero or even fight them. Heck, the first prototype flew in June 1942 only six months into the war and before the Aleutian Islands Zero was recovered. What was true was the the aircraft was up-engined as it was discovered that the initial power plant did not provide the performance needed.) . 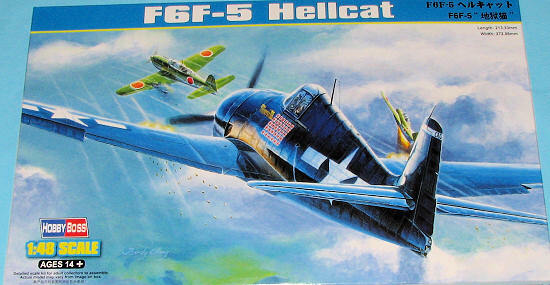 The Hellcat proved to be the most successful aircraft in naval history, destroying 5,271 aircraft while in service with the U.S. Navy and U.S. Marine Corps (5,163 in the Pacific and eight more during the invasion of Southern France, plus 52 with the Royal Navy's Fleet Air Arm during World War II.) Postwar, the Hellcat aircraft was systematically phased out of front line service, but remained in service as late as 1954 as a night-fighter in composite squadrons. 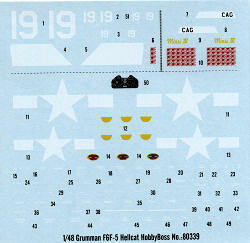 I have to admit that I was rather surprised when I heard that Hobby Boss was producing a Hellcat kit. Frankly, I've always thought that those already available were more than enough for most folks, but marketing has shown that popular types always sell so I guess there is room for one more. 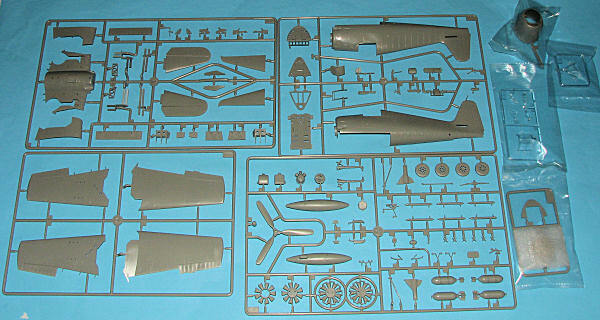 As you'd expect from Hobby Boss, the parts are quite nicely molded and Hobby Boss does provide an option that none of the previous kits offer; folded wings. When one is building the kit, one has a choice of spread or folded wings that is accomplished by one of two different mini-spars that one puts into the wing root stubs. One is straight and the other is folded back. These are both well designed parts and should prove to be quite sturdy. The kit offers a full cockpit with good sidewall detail and a full engine and accessory section as well as engine mounts. These latter two items may well fall under the category of 'modeling for God' as once the fuselage halves are closed, they are basically invisible. There have been comments that the instrument panel looks to be over-scale. Well, when compared to the Eduard kit, the instrument openings are a bit larger, but most will be filling these with the decal that is provided so it is a moot point. There is also some commentary on the shape of the cowling. It isn't identical to either the Eduard or the Hasegawa version and there is an apparent steeper sweep on the underside, but you know, I hate to damn something without taking the time to build it and see how the overall look of the finished product is. Getting back to the bits there are separate flaps, but they appear to be designed to be attached in the up position. The horizontal stabs have the elevators molded into one half, keeping a nice sharp trailing edge. I found it particularly nice that the design of the main landing gear is such that it can be attached at a later stage. Other bits of interest is a separate clear bullet-proof windscreen. The outer windscreen is the later 'frameless' version. The canopy section is separate. For this under wings we have six rockets, two bombs and a drop tank. The holes for all these are already drilled and really, I wish this wasn't don e as these were not always carried. The drop tank looks a tad different from what I'm used to seeing. On other Hellcat kits I've built, the front of the tank would have a strap around it that is quite visible. Hobby Boss has molded a type that has no front strap and a 'standard' looking front attachment point. Looking at the reference, this is apparently correct for later war aircraft, so one learns. About the only kit part that looks a bit off are the wheels. These are molded with very little hub definition so I'd be inclined to replace them with aftermarket. They are radial tread tires. Instructions are well done with the usual Hobby Boss Gunze paint references. The overall markings and painting guide is in full color and provides other paint company options. both are overall sea blue with white prop hub and both use the same plain white insignia. One is David McCampbell's 'Minsi III', a favorite of Hellcat modelers. The other is from VF-9 aboard the USS Lexington in Feb 1945 with a plain white band on the tail. Decals are nicely printed and if you don't like what is offered, there are a considerable number of aftermarket sheets available for the Hellcat. It is nice to have a Hellcat with a folding wings option. Whether this is enough to encourage folks to pick one up in a market that has plenty of 1/48 Hellcats is unknown, but at least it will be something beyond the norm that won't require an expensive aftermarket resin wing-fold set. F6F Hellcat in Action, Squadron Signal 2009, Jim Sullivan and Charles Scrivner. My thanks to Squadron Products for the preview kit. Get yours today at your local retailer or on-line store.